The Allegro ACS755 family of Current Sensor ICs provides economical and precise solutions for DC current sensing in industrial, automotive, commercial, and Communications systems. The device package allows for easy implementation by the customer. Typical applications include Motor Control load detection and management, power supplies, and overcurrent fault protection. The device consists of a precision, low-offset linear Hall circuit with a copper conduction path located near the die. Applied current flowing through this copper conduction path generates a magnetic field which the Hall IC converts into a proportional voltage. Device accuracy is optimized through the close proximity of the magnetic signal to the Hall transducer. A precise, proportional voltage is provided by the low-offset, chopper-stabilized BiCMOS Hall IC, which is programmed for accuracy at the factory. By Allegro MicroSystems, Inc. This is one package pinout of ACS755KCB-150-PSF,If you need more pinouts please download ACS755KCB-150-PSF's pdf datasheet. 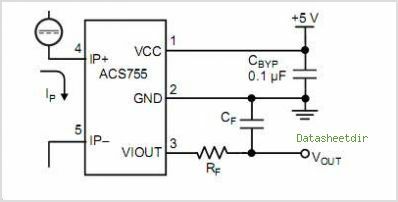 This is one application circuit of ACS755KCB-150-PSF,If you need more circuits,please download ACS755KCB-150-PSF's pdf datasheet.